Gym and Tonic in Uttoxeter will be hosting weight management groups run by the Specialist Adult Dietetic Service, which is provided by Midlands Partnership NHS Foundation Trust. The partnership with Gym and Tonic will involve Mark Inman, Dietetic Physical Activity Practitioner, meeting with patients of the Specialist Adult Dietetic Service at the gym. The weekly groups will include a weigh in aimed at achieving 5% weight loss over 10 weeks or an alternative goal suited to the individual. Attendees will also complete food diaries and exercise plans and join an educational session on subjects such as sugars, the Eat Well Guide and benefits of exercise. As part of the service patients will also receive assessment and support from a Registered Dietitian over a 12 month period. Patients can be referred to the service via their GP or other health professional. Following the session for those being seen as part of the Specialist Adult Dietetic Service, Mark will be available for a ‘drop in’ session for members of Gym and Tonic who may wish to ask questions about healthy eating and weight loss. Mark Inman said “We are committed to helping people with weight loss and management and working with Gym and Tonic means we are able to hold sessions in an accessible, local venue. We can also provide extra sessions for gym members who are concerned about their weight”. 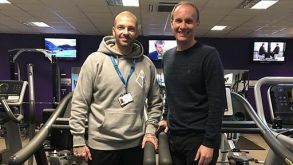 Alex Jones, Director at Gym and Tonic Uttoxeter added, “We are really pleased to be working with the NHS and hope the new clinics will make a real difference to people needing help with weight loss and management”.